The Field Manager is responsible for the proper upkeep and maintenance of the New Milford Bulls field and facilities. 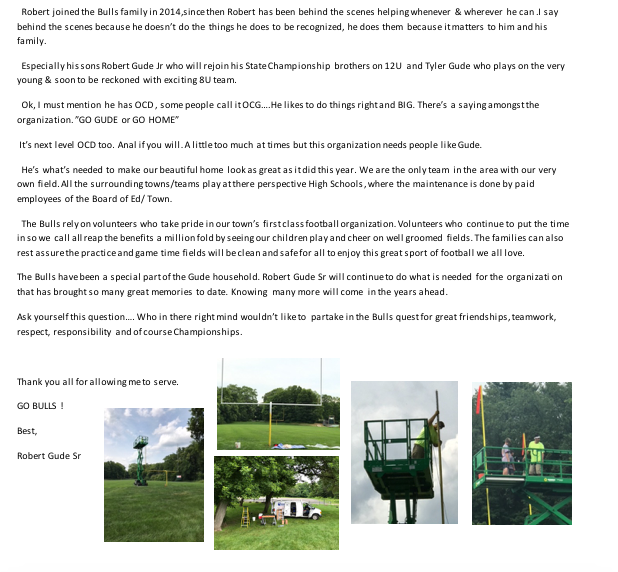 He/She is to ensure that the field is prepared for each home game or event held at the New Milford Bulls fields. The Field Manager shall be responsible for securing multiple bids, when a proposed purchase exceeds $500.00, on needed supplies and services and make recommendations for purchase to the Board. He/She shall provide to the Treasurer a detailed inventory of field maintenance supplies and equipment prior to the start of the Pop Warner season.